Following the severe financial crisis of 2008–2009, the G20’s coordination area has taken on a greater role in discussions of the complex agenda for the global economy. Different organizations from civil society have also become more involved in these issues, enriching discussions around them. 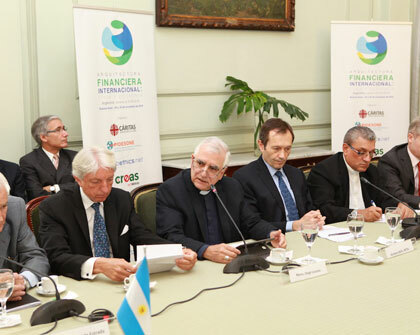 As part of this process, the event “High-Level Dialogue on International Financial Architecture: Ethics and Economics (link in Spanish)” was held in Buenos Aires on November 29 and 30, 2016, in the run-up to Argentina hosting the G20 Conference in 2018. The event was organized by Argentina’s Ministry of Foreign Relations, the United Nations Development Programme (UNDP), the Development Bank of Latin America (CAF), the Institute for the Integration of Latin America and the Caribbean (INTAL), and other organizations, including Caritas Latin America, the International Program on Democracy, Society and the New Economies (PIDESONE), the Regional Ecumenical Advisory and Service Center (CREAS), the Global Ethics Network for Applied Ethics (Globethics), and the Episcopal Commission of Pastoral Care (CEPAS). The event was held at the Ministry of Foreign Relations’ Palacio San Martín. Those who took part in the opening ceremony included the deputy minister of foreign affairs, Carlos Fodadori, the secretary of religious affairs, Santiago de Estrada, the president of the Episcopal Commission of Pastoral Care, Monseñor Jorge Lozano, the director of the World Communion of Reformed Churches, Dora Ester Arce Valentín, UNDP representative René Mauricio Valdés, CAF institutional development officer Jorge Srur, and IDB/INTAL director Gustavo Beliz. the conceptual and regulatory links between ethics, economics, and finance. This area brought together perspectives from a range of disciplines. The discussion largely revolved around the concepts of development, well-being, and poverty, and the concepts used to measure these. In line with the UNDP’s methodology for the Sustainable Development Goals (and the Agenda 2030, which it launched in 2015), the speakers discussed the limits to the use of gross domestic product (GDP) as a metric for growth. The shortcomings of GDP as an indicator include its limitations in long-term analyses (for example, the difficulties in accounting for the effects of growth on environmental sustainability, including the depletion of natural resources) and the debatable parallel it implies between growth and well-being. GDP overlooks issues such as quality of employment and levels of inequality and underestimates the long-term effects of forms of consumption that may be unsustainable (“throw-away culture”). The discussions around metrics for development also looked at how we measure poverty. The ideas that were put forward included the adoption of multidimensional measurement criteria that would be able to capture a range of factors that support human well-being in the long term. It was observed that methodological difficulties would undoubtedly be the hardest to tackle. Likewise, this discussion made it clear that we need to create more efficient public policies and improve institutions and tax systems so that these policies can have a positive impact on society, the world of work, and inequality levels. Another issue that emerged are the multiple potential consequences of increased automation within production as robots are incorporated into various sectors, particularly in developed countries and China. The implications this has for Latin America in terms of its productive matrix and its approach to international integration were examined with a particular focus on Uruguay and the growing challenges to export diversification that it is facing. Economics and Ethics: A Garden of Converging Paths? The second major area of discussion looked at the connection between ethics and economics and the implications of this for international financial architecture, finance and financial inclusion, and corporate social responsibility. As with the first area, the speakers debated the conventional understanding of development and well-being, arguing that there was not necessarily a link between ethics and economic principles. The discussion looked at various lines of research that reveal how economic operations cannot be exempt from an ethical framework. Likewise, the criteria we use to evaluate a given economy should not be limited to purely endogenous parameters but should also establish more complex notions of efficiency that take ethical values into account to ensure that an economy is sustainable in social and ecological terms. International financial flows that have given rise to instability and excessive debt (with distressing consequences for large sectors of society) suggests that the global architecture within which the sector operates needs ethical guidance based on higher values that aim to minimize such social costs. Extreme evidence of the need for ethical foundations and regulations for the economy is the existence of networks of criminality and corruption that are able to grow when public policies and regional or global cooperation agreements fall short of establishing the necessary regulations for these activities. Another finance-related issue is the ethical imperative to guarantee the inclusion of large sectors of the population within streams of financing so as to enable them to build on activities that often take place within the informal sector and for which productivity levels are low. Channeling funds toward these activities would imply rethinking the criteria for the functioning of those markets within a wider ethical framework in which the function of the economy is to improve human well-being, rather than being an end in itself. In a similar vein, the event also looked at the efforts of growing sectors of the business world to operate in a context of social responsibility. In conclusion, a convergence of ethics and economics seems to be one of the requisites for inclusive, sustainable long-term development. See Basco, A., in this issue of INTAL Connection.